Can you believe Thanksgiving is just around the corner? These Turkey Rice Krispie Treats would be a fun treat for Thanksgiving day or to gift a friend or neighbor. Not only are they adorable, but they are actually pretty easy to put together too! 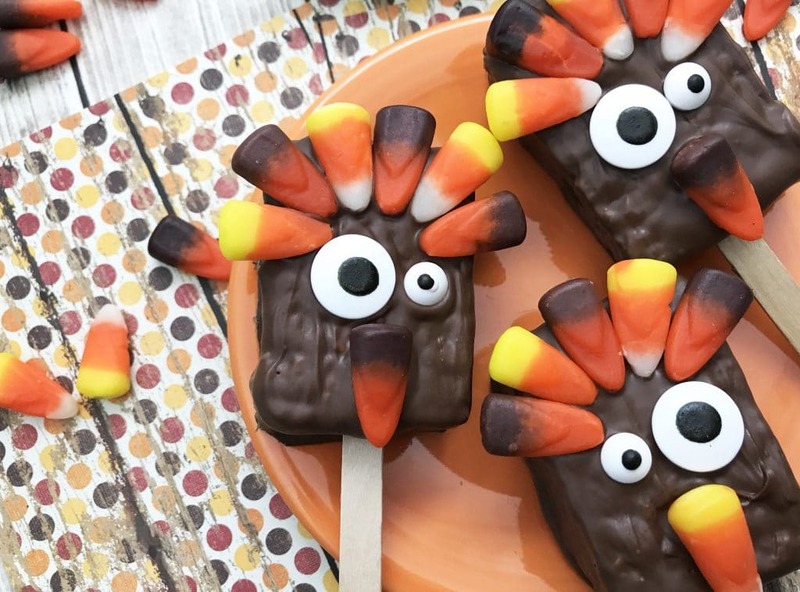 I don’t know about you, but I do not have loads of time to spend putting together complicated Pinterest projects, so these Turkey Rice Krispie Treats are just up my alley! This would also be a fun one to get the kids involved! For this project, you will need: Rice Krispie Treats, Wilton chocolate candy melts, popsicle sticks, candy corn, and candy eye balls. 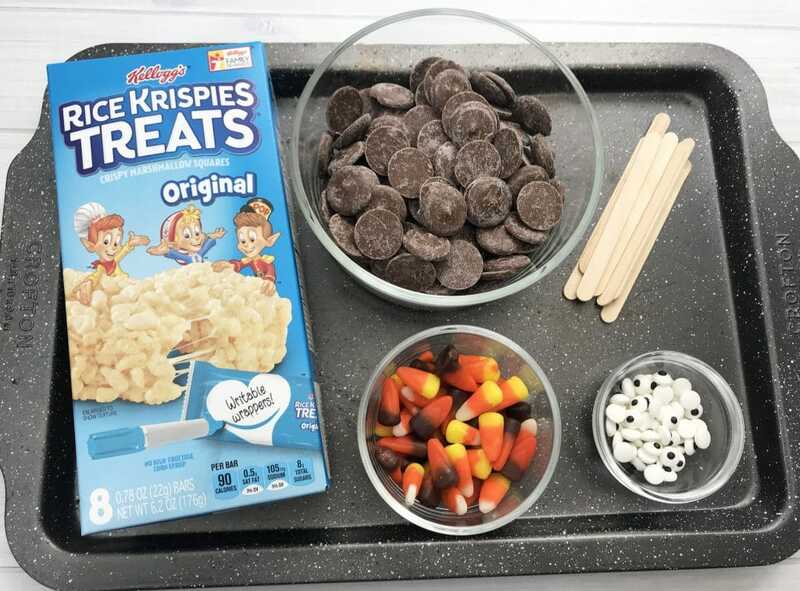 To begin assembling the Turkey Rice Krispie Treats, take the Kellogg’s Rice Krispie Treats out of the wrappers. Then, insert a popsicle stick into the base of each treat. Place the treats on a plate or baking sheet and put in the fridge for about 15 minutes. This will help the Rice Krispie Treats to set onto the popsicle stick a little better. Now it is time for the chocolaty goodness! Pour the Wilton chocolate candy melts into a microwave-safe bowl and microwave in 30 second increments. Microwaving the chocolate in short increments like this helps the chocolate not to burn. After the chocolate is melted, dip each Rice Krispie Treat into the chocolate until well coated. Let the excess chocolate drip back into the bowl. As you finish dipping each Turkey Rice Krispie Treat, put it on a lined baking sheet (parchment or wax paper work well). 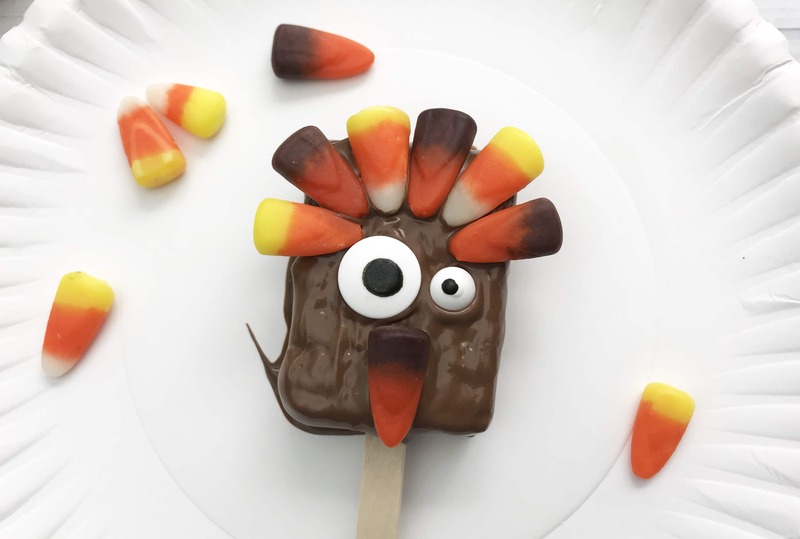 Decorate the Turkey Rice Krispie Treat! Next is the fun part: making it look like a cute little turkey! Put one bigger eye and one smaller eye on one treat. After that, add the candy corn nose. After that, put 6 candy corns at the top to act as the feathers. It is very important that you do these steps before the chocolate dries, because that is what makes it stick. 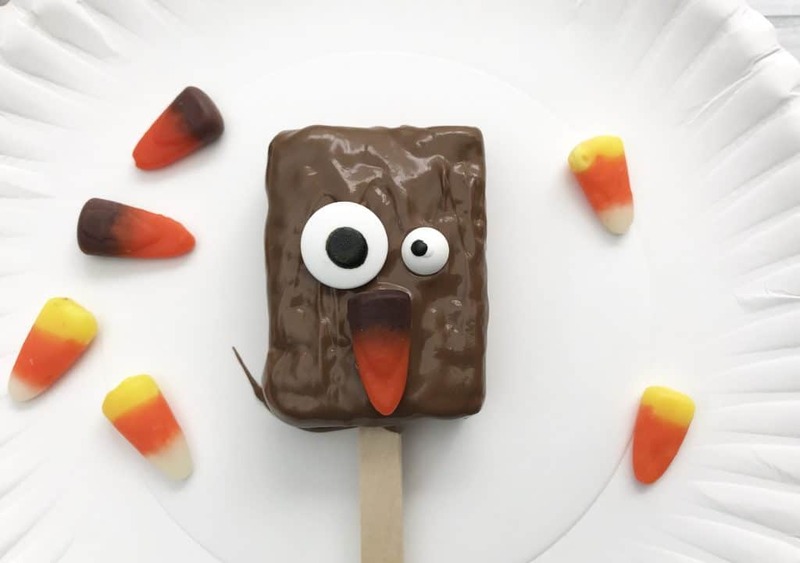 If you did not move fast enough before it dried, you can dot a little chocolate on the back of each candy piece and then affix it to the Turkey Rice Krispie Treat. These Turkey Rice Krispie Treats would be so super cute wrapped in one of those clear cello bags with a little fall colored ribbon. What a cute gift it would make! 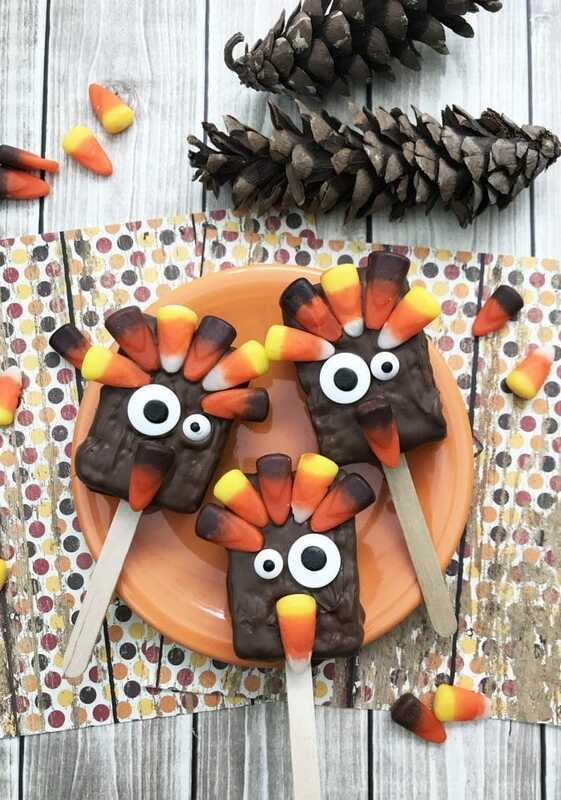 Click below to print out the recipe for the Turkey Rice Krispie treat! If you make them, please stop by our 5 Dinners 1 Hour community Facebook group and post a picture of it! 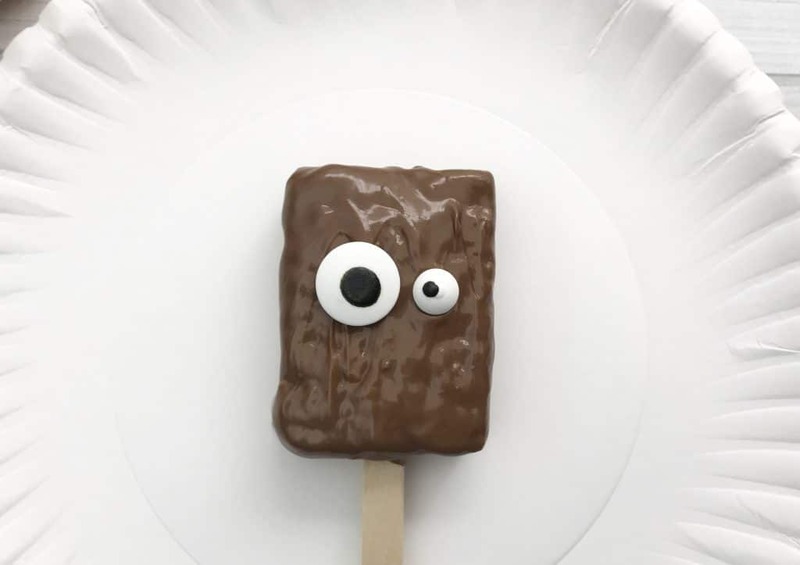 Insert a popsicle stick into the base of each unwrapped Rice Krispie Treat. 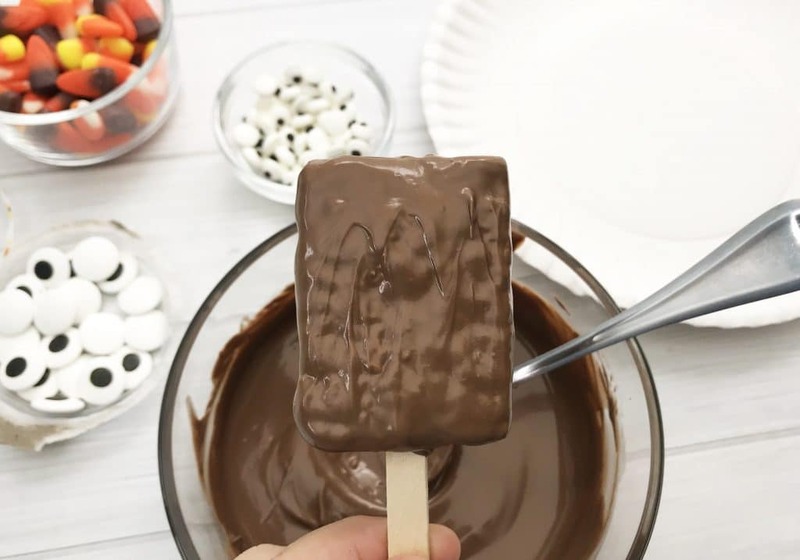 Pour the chocolate candy melts into a microwave safe dish until chocolate has melted. Remove the melted chocolate from the microwave and dip each Rice Krispie treat into the melted chocolate.